Glass Vegas is an revolutionary Expo featuring talented functional glass artists from all across America. Located at the Westgate Las Vegas Resort and Casino, this industry exclusive event will bring highly recognized exhibitors and buyers to Las Vegas, NV. There will be a stage featuring live entertainment and bar areas that will surely create a memorable experience. This event was created to support all the great people and businesses in this industry. We would love to invite everyone to become a part of the Glass Vegas family for our 3rd Annual Glass Vegas American Functional Glass Trade Show. - Includes 8ft black draped table, 2 chairs, ID sign, 8ft backdrops and 3ft side dividers, waste basket. - Booths include one run of house room, tax and resort fees at Westgate Las Vegas Resort for 3 nights, Feb. 11, 12 & 13, 2019. - Exhibitors can move in their product on their own, or use the services of the General Contractor. - Includes 4ft black draped table, 2 chairs, ID sign, 8ft backdrops and 3ft side dividers, waste basket. - Includes 4ft black draped table, 1 chair, ID sign, waste basket. 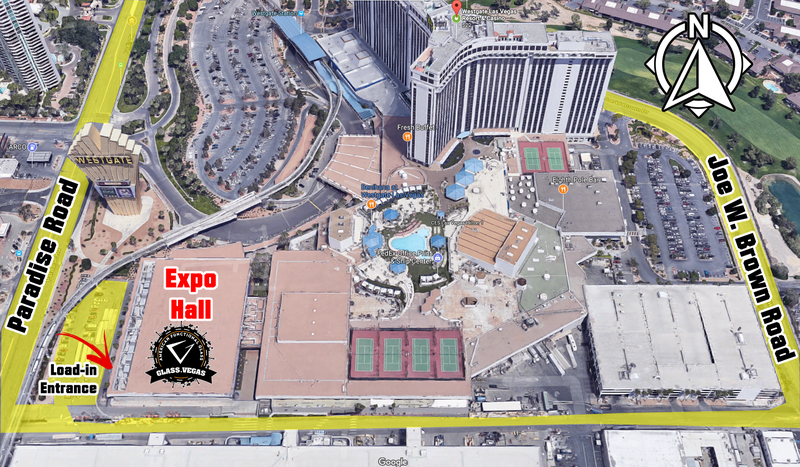 Glass Vegas 2019 is being held in the Exhibit Hall at the Westgate Resort, 3000 Paradise Road, Las Vegas, Nevada 8910 . Load in begins at 11AM Monday, February 11 and you must be set up NO LATER than 7:30 PM. Doors open @ 8PM sharp. No one is allowed on the show floor without proper badging. You + your staff may pick up badges as early as 10:00 AM Monday at the Registration Desk. Complimentary LOADING DOCK registration (MONDAY ONLY) will be available to you beginning at 10AM. Loading Dock Reg closes at 5pm. Proper Identification is required for badge pickup. No Exceptions will be made. 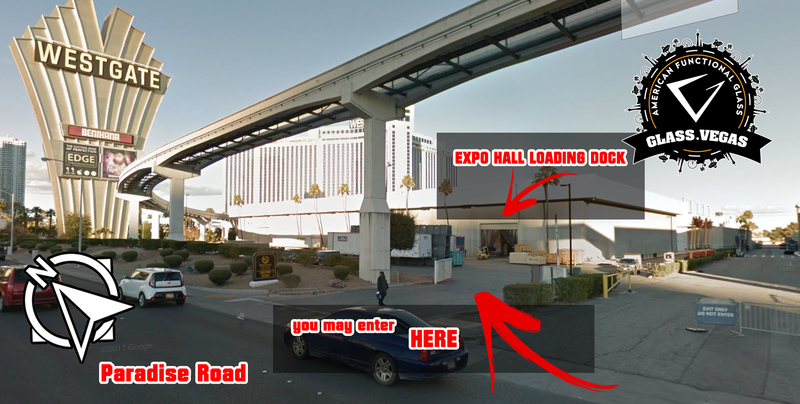 If desired, you may bring your product through the hotel and into the front doors of the expo hall or you can unload and come in through the loading dock in the back of the hotel, Paradise Road side. 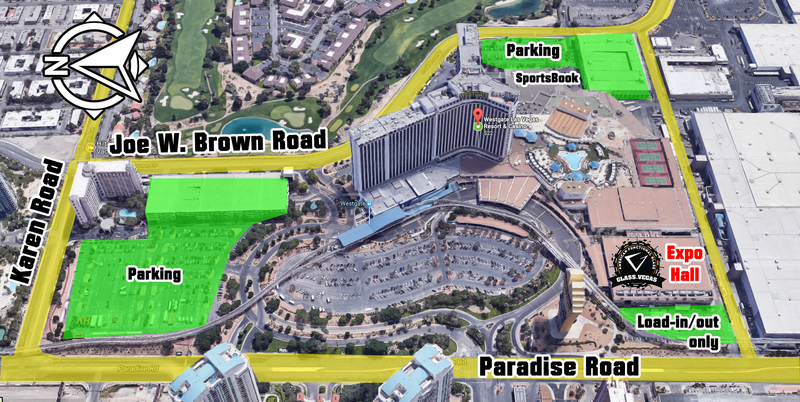 You can access the unnamed road between the Westgate and the Las Vegas Convention Center either from Paradise or Joe W. Brown, please consult the map below. Please unload quickly and move your vehicle so others can do the same. Also, there will be a few complimentary loading carts you may share with others. Need more exhibitor information? Feel free to contact us at 800-217-4527 or email us today with any questions.